Celebrate the end of 2018 and ring in the New Year with Fortnite: Battle Royale. In this year of seemingly endless updates, events, and additions to the world’s most popular Battle Royale mode, there’s still one more event for players to experience, but you’ve only got a little time before it’s gone. So, what is this event even about? Up in the sky, a giant rift will open and reveal a flashy disco ball. The ball drops, an unseen crowd chants a countdown, and fireworks appear in the sky to ring in the new year. It’s a flashy event, and it’s running globally — yes, that means you’ll see this event appear every hour until it’s 2019 globally. 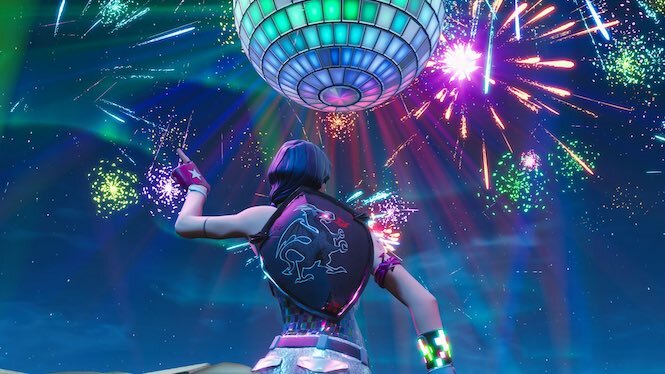 You’ll be seeing this event run before (and after) it’s actually 2019 in your particular territory, so there’s no need to play Fortnite instead of partying with friends and / or family. That means you can also miss it, and still experience the fun — or get annoyed when you see it multiple times. And don’t worry about griefers. Unlike other holiday events, the New Year’s Ball Drop forces everyone to dance while the crowd counts down. That means you can watch the event in peace without getting shot in the back. That’s a nice change. But, once the ball blows up, it’s every man and woman for themselves — just like Fortnite intended. Let’s take this time to remember the good times this year. Fortnite added (and then removed) ATK Karts, planes, remote-controlled missiles, super-powered swords, and a little bit of Thanos. It was a good year, and with the new Epic Store reveal, the developer might just have an even stronger 2019.